While there's still no sign of it on the UK Google Play Store, third-party online retailer Expansys has somehow gotten its hands on some stock, which it claims will arrive in four days. The retailer is charging £310 for the 16GB device (that's £30 more than Google charges for the black device) and is pledging that shipping will commence in between 7-9 days. 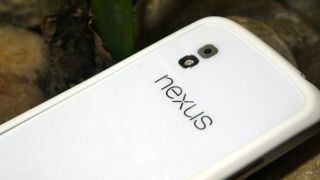 The Nexus 4 itself was a groundbreaker in terms of offering high-end specs for low-end cost, but was plagued by supply issues meaning many hoping to obtain the device were forced to look elsewhere. With the possibility of a Nexus 5 running Key Lime Pie on the horizon, the quad-core, Nexus 4 isn't quite the hot commodity it was a few months back, but it remains a great SIM-free option. It rocks a 4.7-inch 1280 x 768 screen with 320 pixels-per-inch, a 1.5GHz quad-core Qualcomm Snapdragon S4 Pro processor and an 8-megapixel camera to boot. As of last month, it also has Android 4.3 Jelly Bean available too, so perhaps that's something to consider -especially with the current penchant for the raw Android experience. Speaking of Android 4.3, exactly what's new in the latest Jelly Bean update?